Booking terms and conditions Reservations are made through the website or email. 30% deposit is due upon booking, the balance on arrival. -Immediate -Booking via the website. payment mode: Paypal or bank transfer. -Booking by check (Only for French customers or have a bank checking account in France). The customer has a period of 5 days after the reservation request to send the check to the order of Ivan REY, at the following address: Vieuxboucau Surflodge, 5 avenue dunes, 40480 Vieux Boucau, France After receipt of the deposit, you will receive a confirmation email. - Arrival : The arrival can be done from 15h until 19h on the day begins your booking. - Departure: The departure must be before 12am. - Maintenance: Cleaning of common areas and rooms is done every day. Bed linen is changed at the end of the stay. - Attempt to obtain unauthorized access to a computer. By accepting these terms and conditions, the Customer certifies that the computer (if it runs on a Microsoft operating system) has no viruses and is protected by an anti-virus update. Customer is responsible for his computer. The Lodge can not be held responsible for any loss, theft or damage. - Rules: Vieuxboucau Surflodge being a quiet, noise is forbidden after 22:00. Night returns must be in the quiet so as not to disturb the sleeping Clients. By accepting these terms and conditions, the Customer undertakes to respect the peaceful character of the place and preserve the peace of others. The enclosure of the Vieuxboucau Surflodge is only for customers. Anyone outside the lodge will seek approval for management to enter. Management reserves the right to immediately terminate the stay of a client whose behavior would disrupt the good experience of other clients. The Vieuxboucau Surflodge can not accommodate unaccompanied minors or pets. It is forbidden to smoke inside the buildings. Ashtrays are willing Outside, thank you to use and to respect the right of nonsmokers to breathe clean air. Requests for higher group to 6 people will be studied case by case, please make your request by email. The deliberate degradation of furniture will be invoiced to the value of re-purchase. 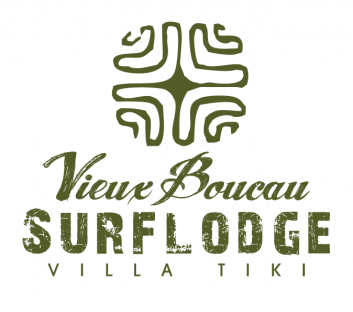 Responsibility: Vieuxboucau Surflodge declines any responsibility in case of theft, loss or damage of your personal belongings. Padlock Lockers are available to guests in each room in order to reach safety effects value. On the other hand, customers must be covered by liability insurance. Force Majeure: Vieuxboucau Surflodge not be held liable to the customer for non-performance of its obligations for force majeure. Are considered as force majeure or fortuitous event those usually recognized by precedents in the French Courts. Computer data: Pursuant to Article 27 of Law No. 78-17 of 6 January 1978 on computers, you have a right to access and correct data concerning you by sending us a letter or an email. On the other hand, the Vieuxboucau Surflodge agrees not disclose to third parties the information you have entrusted to him. Dispute: In case of rejection of payment, the customer will bear the bank charges relating to the rejection. In case of dispute, only the Court of First Instance in Bayonne will be competent.